Thailand has been on my “list” since my first experience with Thai food at this cute, quaint Thai restaurant several years ago in Atlanta. I wish I could remember the name of the place, but it escapes me at this time. Nonetheless, I remember thinking to myself that if the food was this good here in Atlanta, then it would have to be 100 times better in the local area of Thailand. So…yes, food fueled my desire to get to Thailand and well, their epic Full Moon party, but that’s another story. Needless to say, the moment I confirmed that I would be living in China for the at least the next year I started planning our trip to Thailand. Initially, it was going to be our Christmas holiday trip, but when the Mid-Autumn Fall Break rolled around, I decided I couldn’t wait to find refuge in a different foreign land. And I desperately needed a place much different than my current country of residence. Bangkok gave me all that I needed and then some. 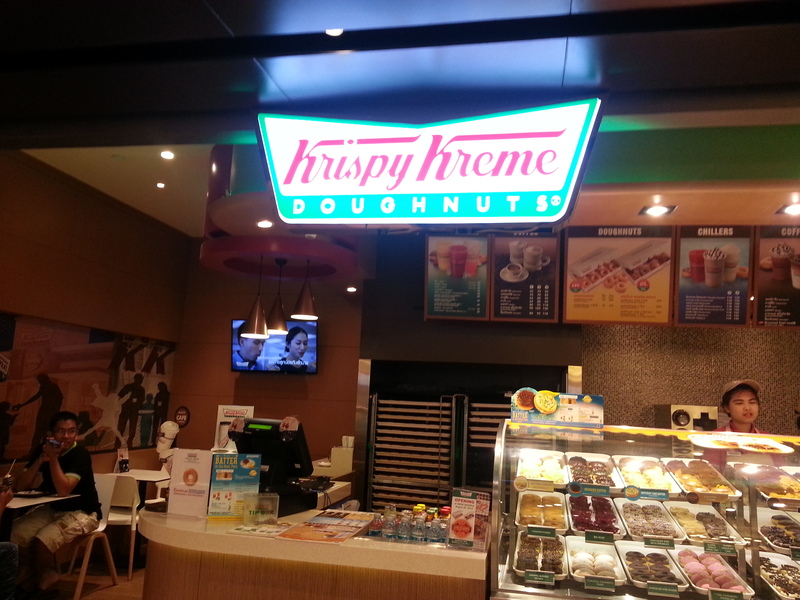 Krispy Kreme in Emporium Mall. Our first night there we discovered a comprehensive dining guide in our modern and well-appointed rental apartment which was located in Circle 12 Condominiums on Sukhumvit Soi 12. It wasn’t my intent to do much restaurant eating as I am a street food fanatic, but my daughter saw that there was a Krispy Kreme in the Emporium shopping center and, being the doughnut aficionado she is, nearly lost her mind. At that moment, our mission became to find the doughnuts, after eating dinner and getting massages of course. So we officially began our trip with dinner at Stable Lodge where indulged in traditional Thai fare, followed by two wonderful full body scrubs with massages from a little place on Soi 8 called Relax…and something else. Honestly, the name doesn’t matter much. It was the only place on the street that did full body scrubs. Now, as far as extras, I don’t know anything about that, but our place seemed legit and while it was a bit shabby, the body work was the bomb and the price was super cheap. One of the great things we discovered, soon after arrival, is that navigating Bangkok was 10 times easier than navigating Foshan. We didn’t face the same language barriers, the public transportation system was easy to understand and use and there dozens of familiar shops and restaurants. Krispy Kreme just happened to be one of them. So after we bought the Krispy Kreme we explored the multitude of shops, restaurants and stalls in Emporium and Terminal 21. We saw everything from Louis Vuitton to Sephora to Payless Shoes to Wine Market and even a boutique grocery store in the mall. The food courts in these places were absolutely amazing. Fine dining to fast food to stalls that resembled those at the night markets were all there. It was shopping and foodie heaven! But the thing that made us miss home the most, the thing that caused the throat knot and the misty eyes, was the sight of Krispy Kreme. I don’t know how the Creator knew that we needed that little piece of home, but it was right on time. Honestly, Bangkok was right on time in many more ways. 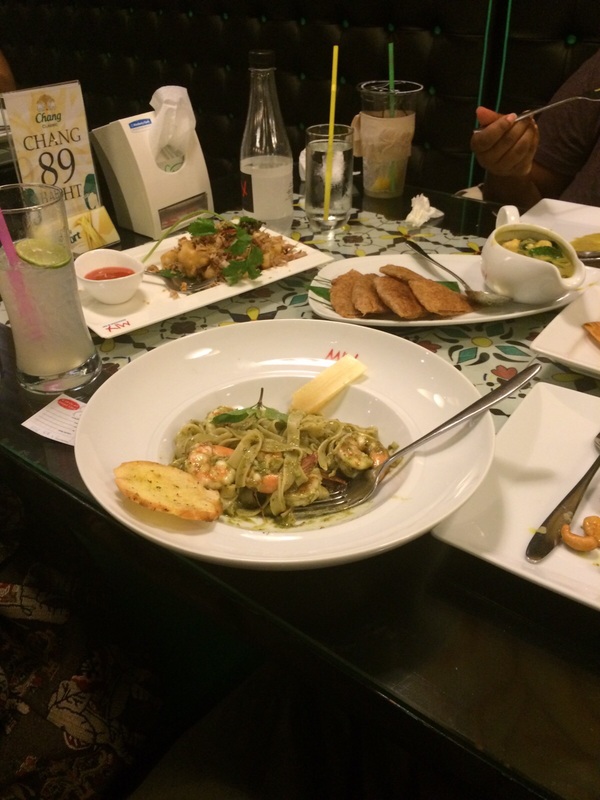 Our “moveable feast” at restaurant Mix 21 in the Terminal 21 mall. This entry was posted in Asia, Bangkok, black travel, expat, expat life, Foodie, living abroad, single parent travel, solo travel, Southeast Asia, Thailand, Travel, women travel.